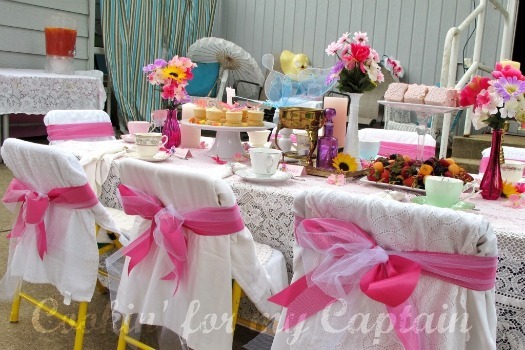 Ever since that day I found out I was having a girl, I knew I’d throw her a tea party for one of her birthdays. This year was the one! We are in a beautiful area, all her school friends are within a 2-block radius, weather is nice, flowers are blooming—it would be silly not to! But this also means I’ve had years of collecting and gathering of tea-party “stuff.” Every time I went into a thrift store, I looked for tea-cups with saucers that went together, and other tea-party random items. Most of my search, however, was in the last few months. 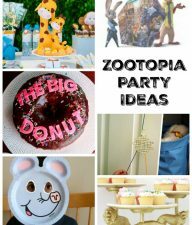 So it is possible to throw this party with enough planning and time. Patience is the key…and so is spray paint. When looking at thrift stores, make sure you don’t over pay. 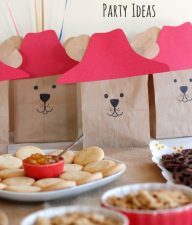 For a kids’ tea-party, it doesn’t need to be gold or silver. I keep an eye out for candle holders especially. They can be used so many different ways! And never look at the COLOR of things. It’s easily covered up with spray paint! Also look for birdcages, tea pots and trays. Brass is a good “fake gold.” Little girls will never know the difference. When I find tea-cups, I usually spend about $0.50 [fifty cents] each (per plate, per cup) and NO MORE than $1.25 each. Don’t look for multiples in a set; keep the eclectic look to it. Other items such as candle sticks, baskets and such I keep around $3.00 or less. Don’t be discouraged if you don’t find anything—just try another store or come back another time. My other tip: ask around! My mother ended up having a huge bin of lace tablecloths and other lacey stuff. And then she let me keep them! And even if that person won’t let you keep them, borrow them! Lace tablecloths are not an easy come-by item, so when you do find them—get them! 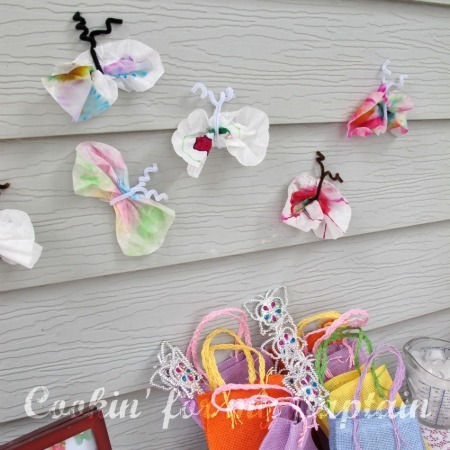 Decorations: When your surrounding might not be “pretty,” think outside the box! We have a very ugly shed, so I draped lace and white tablecloths in front of it. It makes for a much better background in pictures! The table is a really easy thing to think about decorating, just don’t forget about the chairs. I draped a white pillow case over the chair, then used ribbon and tulle to make a pretty bow. Its was that simple! Food: Now, don’t forget the food for the party! Think simple, yet creative. I let my daughter decide what to do. She loves peanut butter and jelly sandwiches and fruit. So I made miniature fruit skewers, PB&J mini sandwiches, and then I also used Little Debbie snacks! When you take them out of the wrapper, no one will ever think they are store bought! If you have a little or older brother, or a really cool dad, let them serve the food. My son (younger) thought it was the coolest thing. 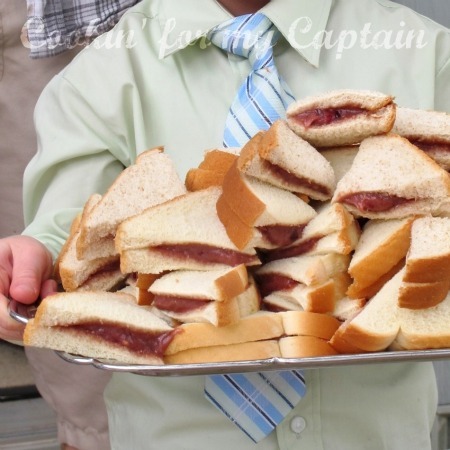 He went around and served the girls sandwiches! Cake: Now for the best part, the “cake.” I saw this idea on a blog [I didn’t save the URL—so sorry! It was a wonderful idea]. I have the recipe back on my blog. 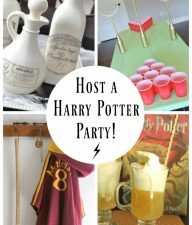 Learning from my mistake: make these the day of the party! I made a batch early, and by party time they were soggy. 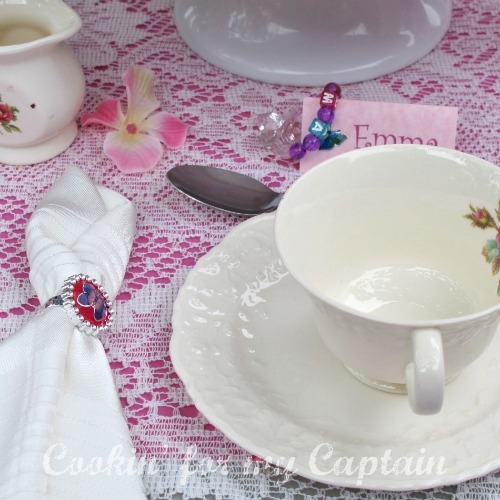 So to keep the tea-cups fresh and crisp, have everything ready and assemble before party. 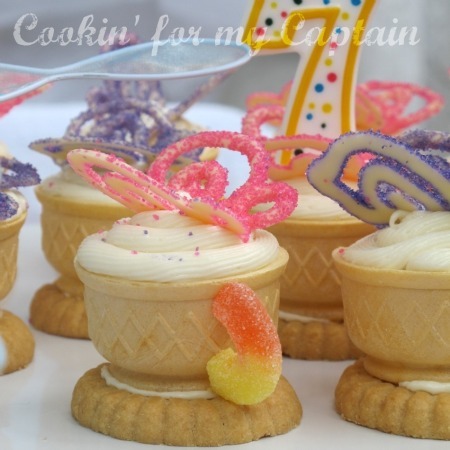 Crafts: For birthday parties, I like have a craft and a treat. For the craft, I had the girls color on coffee filter, then brush water on top and it makes a really pretty effect. 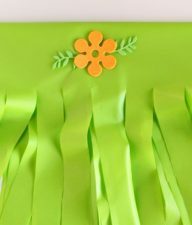 Once dry, bunch them up and tie pipe-cleaners around them and whoooola! 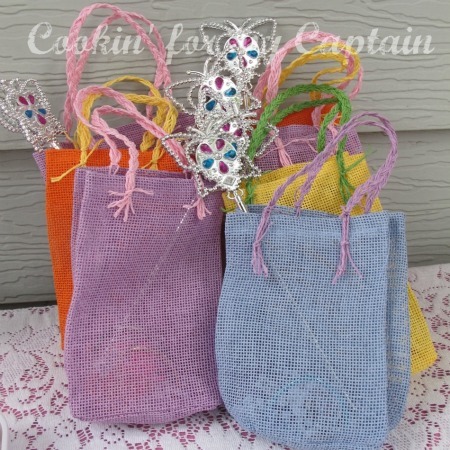 Treat Bags: The treat bags were also a collection of clearance items. At the end of the party, the kids got to hit on a piñata and used their bags to catch the candy. 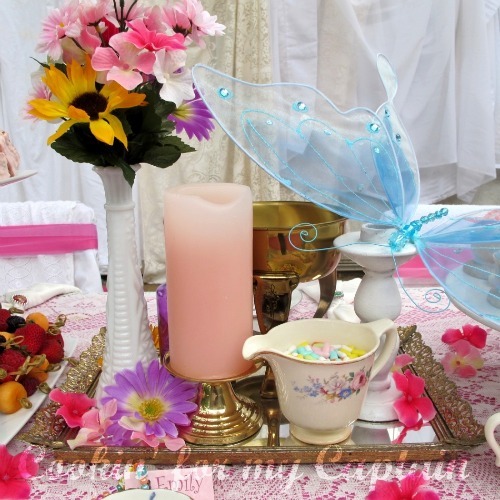 I kept everything with butterfly theme: wands, butterfly bubbles, a few jewelry pieces like bracelets and necklace. It’s the little things that count! Keep in mind parents and siblings that come too! I made a “parents” corner with paper plates and extra tea so they can sit and enjoy the party as well. Have a schedule of “events” to keep the party rolling. Stay calm and relaxed. You will have a much better time if you do. I hope that you enjoyed seeing the tea-party! I had a wonderful time planning and then putting this post together. It made me replay all the fun we had. And thanks to the Make & Takes crew for featuring me! My name is Carolyn, and I’m an Army wife and a SAHM of 2 beautiful redheads. I have a major in art, but because of all the moving around we do, I find creative ways to express my artsy side. I love cooking especially, and really enjoy trying new things, letting my kids join, and throwing parties. For more of my recipes and ideas, visit and follow along my blog. Wow, so cute! That cake with the teacups/butterflies is brilliant! I like your ideas here. when my daughter was growing up she hosted many a holiday tea party. My favorite? The Halloween Tea… each little girl had a fantastic witches hat (because one must always wear a tea party hat!) with a huge purple netted bow that draped down. Now I’m holding tea parties for my great nieces.. just waiting for granddaughters! What a beautiful tea party! The table is set so nicely, and the chairs are a perfect touch. I think tea parties are great for all ages! This is super post! Perhaps you’d like to share some of your tips at a twitter tea party taking place on Thursday all about tea parties for children – the aim of the twitter tea party is to share good idea, but also to raise awareness of a great campaign by Save the Children – all details are here: http://www.redtedart.com/2011/05/30/charity-twitter-tea-party/ and you can find out more from Maggy @redtedart Would love to see you there!